BePooler has partnered with Visionect in promoting sustainable mobility through the use of off-the-grid electronic paper parking signs which reserve free parking spots for commuters in Bepooler’s Park & Ride scheme. Currently in use by 15 European companies, the BePooler carpooling service generates over 300 shared trips per week and offers preferential parking spaces booked for those who join the service. Currently BePooler’s Park & Ride scheme allows commuters to carpool to Switzerland’s Ponte Tresa station and have a reserved parking space waiting for them when they continue their journey by train (a selection of reserved parking spots is available also to visitors of the Gambarogno sports centre). These parking spots are clearly marked in real-time, displaying the licence plates of the vehicles participating in the program on solar-powered electronic paper displays. They are powered by Visionect technology, tried and tested in numerous demanding outdoor applications, from eink traffic signs in Australia to bus stops in London. 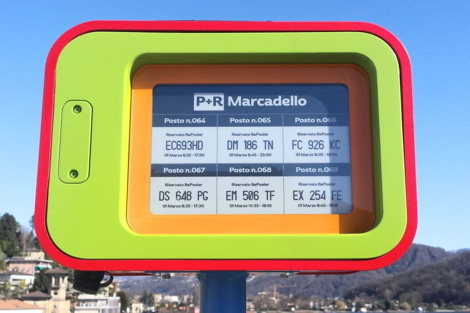 The Park Smart Signs have been developed to be independent from the electrical grid, using as little power as possible and supporting impeccable sunlight readability, connecting via 3G to receive content updates. Users can securely book the parking spot through the BePooler App wherever they are, with the licence plate of the car allowed to park showing up on the parking sign mere seconds later. Implemented in collaboration with the communities of Lavena-Ponte Tresa, Italy and Ponte Tresa, Switzerland, we understand that the project is now making its way to France. This entry was posted on Monday, November 21st, 2016 at 06:00 @291 and is filed under DailyDOOH Update. You can follow any responses to this entry through the RSS 2.0 feed. You can leave a response, or trackback from your own site.